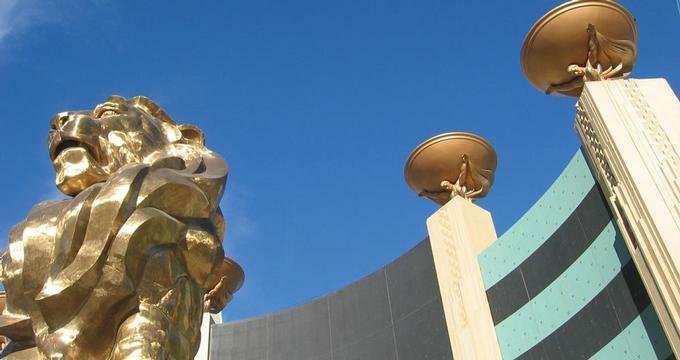 MGM Grand, located on the Strip, is famous for its 45-foot tall, 100,000 pound bronze lion statue situated at the entrance to the resort. The property is home to the Grand Garden Arena which hosts special events, including mega concerts and championship boxing. The Signature is a luxury all-suite hotel that gives vacationers access to the attractions and amenities at the MGM Grand. The casino floor measures 171,000 square feet which equals four football fields. Guests can choose from a variety of games, including Blackjack, Baccarat, Roulette, Craps, and sports book. In addition to gaming, the resort offers a variety of entertainment, dining and relaxation options. The Grand Pool Complex measures 6.6 acres and has five swimming pools, a river and waterfalls. Guests can rent private cabana and enjoy poolside cocktail service. The Spa and Fitness Center measures 30,000-square-feet in size and offers a selection of massages and signature treatments, such as AHA Facial, Parafango with Exfoliation, and the Milk-and-Honey Body Treatment with Exfoliation. See more spas. A unique area is the Lion Habitat where guests can view lions in a see-through, walkway tunnel that runs through the Habitat, allowing lions to prowl above and below. Guest rooms and luxury suites and decorated in art deco style. The guest accommodations are located in four 30-story towers which rise 280 feet high. The 29th floor offers three Grand Class Suites and four Villas. 29 ultra luxurious private villas are located inside The Mansion. There is a 740-seat theater which attracts top performers, including Rodney Dangerfield, David Copperfield, George Carlin, and others. La Femme, a show that uses a combination of light effects, film, and projections to create dramatic effects, is staged at La Femme Theater. Studio 54, one of the hottest nightclubs in town, offers four dance floors and bars, an exclusive area on the second floor for invited guests, and several semi-private lounges that can accommodate up to 400 people. There are several bars and lounges with live entertainment, including the Showbar Lounge and Zuri, and the lobby bar. The hotel offers many different culinary choices, ranging from signature restaurants to more casual settings. Nobhill serves classic and contemporary dishes; Craftsteak is an American a la carte steak restaurant; Emeril Lagasse's New Orleans Fish House serves seafood delicacies; Olio! serves Neo-Italian cuisine. Nearby hotels and attractions include New York-New York Hotel with its replicas of New York City landmarks and a roller coaster, the pyramid at Luxor and Mandalay Bay. Tropicana is just across the street. The Grand Garden Arena is a 16,800-seat special events center that hosts concerts, championship boxing and premier sporting events. The building features state-of-the-art acoustics, lighting and sound. Past music performances have featured Barbra Streisand, Elton John & Billy Joel. Ticket prices vary depending on the event. If want a luxury suite with a view of the Strip, take a look at The Signature at MGM Grand. Comprised of three towers with individual lobbies, the hotel features all-suite accommodations with balconies and scenic views. You will be close to the restaurants, nightlife and entertainment of the famous resort. There are three classes of suites to choose from : The Signature One Bedroom Balcony Suite is a great choice because of its floor-to-ceiling windows overlooking the city's major attractions. The 950-square foot suite has a private balcony with scenic views. Luxuries include 300-thread-count cotton sheets and stylish bathroom amenities. The gourmet delicatessen on Tower 2 serves breakfast and lunch indoors or outside on our patio. For dinner, head to one of the gourmet restaurants at the MGM or other resorts in the area. The Signature has a swimming pool and offers in-room dining. Suites start at $150 per night (signaturemgmgrand.com). Rates for deluxe guest rooms start from USD $99 per night, while suites cost from $199 to $15,000.